Is it really Wednesday? Not sure if I feel like it should be Monday or Friday some weeks! So many projects are happening all at once and so the executive decision was made last night that I would add one more fun project into the mix! 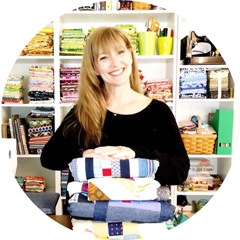 Angie from Gnome Angel is hosting a fun ( affiliate link) Tula Pink Modern City Sampler 100 Modern Quilt Blocks Instagram Sew Along! Find out how to participate for fun and prizes by visiting 100 days 100 Blocks Sew Along! I started off in grand style by choosing the first block based on what color thread I currently had on my machine and bobbin. 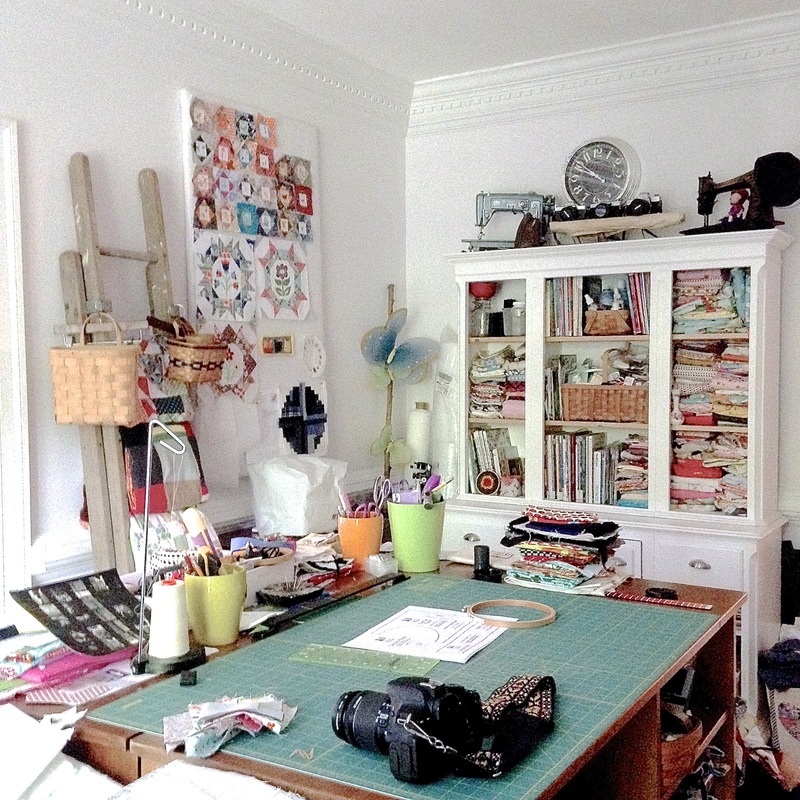 I am that sewist! I will take the path of least resistance every single time! The thread was left over from a pencil pouch I made for Katy's new school year! It is kind of a tradition that started when she was in fourth grade. This year I made a Cat Eye Pouch using the free pattern from Thread Riding Hood! Great pattern! Even after the first block was completed, I still had a ton of purple thread left on my bobbin ( Aurifil 50wt is thin and fill a bobbin!). so I made the executive decision to make a blue and white quilt using thrifted shirts! I have always loved the look of blue and white quilts and the purple thread does not show at all! My constant Work In Progress is my sewing studio! I can never find the perfect set up or the perfect amount of space, so it is constantly changing. Katy was kind enough to help me out to tidy it up last weekend. The kids grandmother is visiting and my sewing was taking over the entire house ( at least the bottom floor). There is more to do, there always is, but at least it looks good for now. Finally, I cannot remember if I shared my block for The Splendid Sampler. I am really far behind! Traveling, out of town guests and Summer Break have cut deep into my sewing schedule. My groove will be back very soon! What have you been working on to get your WIP's under control or have you added new ones? I am in a "no new projects" phase at the moment and even had to say no to some further out items that I had tentatively committed to. I need to clear off my plate and take a deep breath, I think! 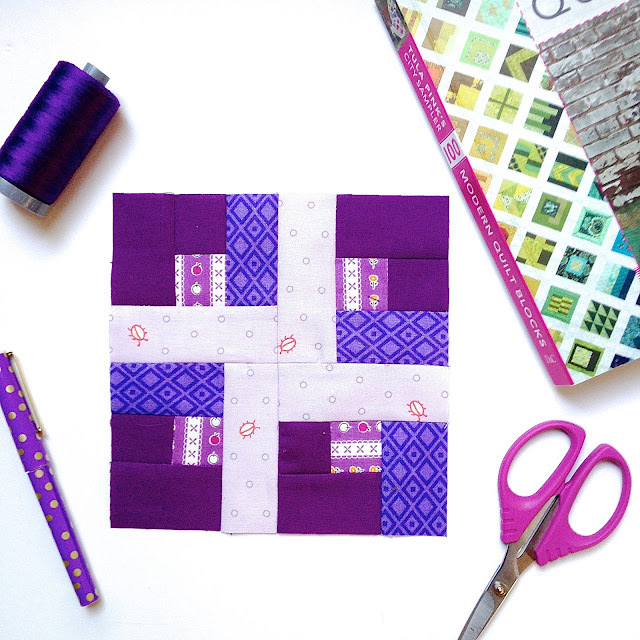 :) I do love how you chose to work with purple for your first Tula block based on the thread you had in your machine. My daughter just had a baby boy last week, so I am staying with her at the moment and helping out. Lovely job, but the sewing got very far behind. Even took my sewing machine with me. What was I thinking??? That I would have time!!! Purple is my favorite color so I fell totally in love with your purple block but the blue block is absolutely striking! Thanks for sharing.